You have one idea of how things should be done, but your friend has a different idea. How do you reconcile that? Sometimes you can't, and a rift in the friendship could establish itself before the project even starts. Talk your project over at length and establish expectations from the get-go to avoid this initial roadblock if you really want to hire a friend. You hired your friend because he or she is a good friend, and is always there when you need them. But while their loyalty is on point, their work ethic may be lacking. Halfway into the project, they might be missing deadlines because they think they can get away with it based on your bond. If you're hiring a friend, you might expect a "friends and family" discount. But going into the project with that mindset will likely offend your friend from the jump. 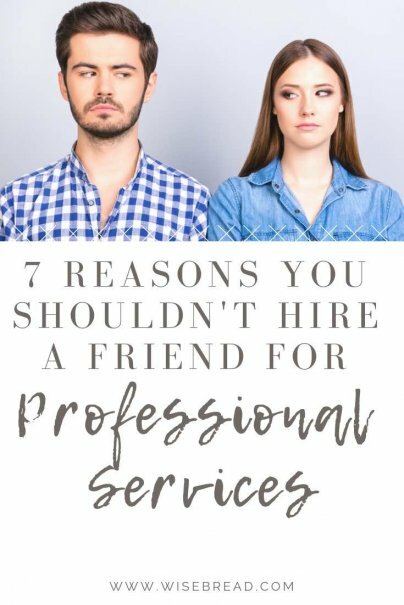 If you're not prepared to pay your friend's standard rate for services, hire someone else, preferably the pro whose services are in your price range. It's hard to take criticism from anyone, especially a friend. Likewise, you may find yourself being more critical of your friend than you would a service provider with whom you have no relationship, because you feel more comfortable being honest with your friend. Honesty is okay — you deserve to get what you pay for — but at what cost? Not the price of a friendship. Even if you're okay with giving your friend special treatment, this favoritism will not sit well will other employees or contractors. Why does your friend have different rules and expectations? Sure, you've known each other longer and perhaps your families spend time with each other outside of work, but that's not a fair position to take when everyone else is working just as hard or harder than your friend. You don't want a mutiny on your hands. If your project is going down the tubes because your friend didn't live up to your expectations, you will have to fire them, but how do you do that to a friend? You don't. You hired a friend, but you'll have to fire your ex-friend. Feelings will probably be hurt, words will be exchanged, and demands may be made. None of that bodes well for the friendship, at least not in the capacity it was before the professional relationship began.